Home » Meet Our Staff » Our Providers » J. William Kerns, M.D. Special areas of expertise: Certificate in Qualitative Research, UNC Chapel Hill; Family Practice Fellowship, Virginia Commonwealth University; primary care research. 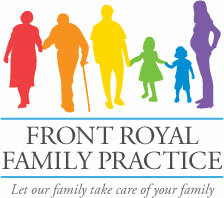 Dr. Kerns has been with Front Royal Family Practice since its inception. He enjoys developing relationships with patients and their families over several generations, making the hard work of comprehensive family medicine incredibly rewarding. Teaching and research have been interests since his undergraduate time at Yale. When not working, he enjoys time with his wife Christine, as well as with their daughters and grandchildren. His dogs keep him moving (they insist), and relaxation can be found in aging spirits in small casks, and enjoying what others have aged, particularly single-malts.